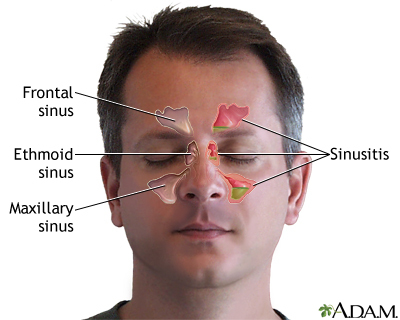 Sinusitis is present when the tissue lining the sinuses become swollen or inflamed. It occurs as the result of an infection from a virus, bacteria, or fungus. 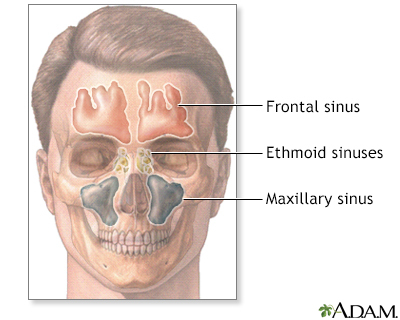 The sinuses are air-filled spaces in the skull. They are located behind the forehead, nasal bones, cheeks, and eyes. Healthy sinuses contain no bacteria or other germs. Most of the time, mucus is able to drain out and air is able to flow through the sinuses. When the sinus openings become blocked or too much mucus builds up, bacteria and other germs can grow more easily. Small hairs (cilia) in the sinuses fail to properly move mucus out. This may be due to some medical conditions. Colds and allergies may cause too much mucus to be made or block the opening of the sinuses. A deviated nasal septum, nasal bone spur, or nasal polyps may block the opening of the sinuses. Acute sinusitis is when symptoms are present for 4 weeks or less. It is caused by bacteria growing in the sinuses. Chronic sinusitis is when the swelling of the sinuses is present for longer than 3 months. It may be caused by bacteria or a fungus. Symptoms of chronic sinusitis are the same as those of acute sinusitis. However, the symptoms tend to be milder and last longer than 12 weeks. The provider may view the sinuses through a fiberoptic scope (called nasal endoscopy or rhinoscopy) to diagnose sinusitis. This is often done by doctors who specialize in ear, nose, and throat problems (ENTs). Most of the time, regular x-rays of the sinuses do not diagnose sinusitis well. Apply a warm, moist washcloth to your face several times a day. Drink plenty of fluids to thin the mucus. Inhale steam 2 to 4 times per day (for example, while sitting in the bathroom with the shower running). Spray with nasal saline several times per day. Use a Neti pot or saline squeeze bottle to flush the sinuses. Be careful with use of over-the-counter spray nasal decongestants such as oxymetazoline (Afrin) or neosynephrine. They may help at first, but using them for more than 3 to 5 days can make nasal stuffiness worse. Avoid flying when you are congested. Avoid temperature extremes, sudden changes in temperature, and bending forward with your head down. Acute sinusitis should be treated for 10 to 14 days. Chronic sinusitis should be treated for 3 to 4 weeks. Some people with chronic sinusitis may need special medicines to treat fungal infections. Your symptoms do not go away after 3 months of treatment. You have more than 2 or 3 episodes of acute sinusitis each year. Most fungal sinus infections need surgery. Surgery to repair a deviated septum or nasal polyps may prevent the condition from returning. Most sinus infections can be cured with self-care measures and medical treatment. If you are having repeated attacks, you should be checked for causes such as nasal polyps or other problems, such as allergies. Your symptoms last longer than 10 to 14 days or you have a cold that gets worse after 7 days. You have a severe headache that is not relieved by over-the-counter pain medicine. You still have symptoms after taking all of your antibiotics properly. You have any changes in your vision during a sinus infection. A green or yellow discharge does not mean that you definitely have a sinus infection or need antibiotics. The best way to prevent sinusitis is to avoid colds and flu or treat problems quickly. Eat plenty of fruits and vegetables, which are rich in antioxidants and other chemicals that could boost your immune system and help your body resist infection. Get an influenza vaccine each year. Wash your hands often, particularly after shaking hands with others. Drink plenty of fluids to increase moisture in your body. Take decongestants during an upper respiratory infection. Treat allergies quickly and appropriately. Use a humidifier to increase moisture in your nose and sinuses. DeMuri GP, Wald ER. Sinusitis. In: Bennett JE, Dolin R, Blaser MJ, eds. Mandell, Douglas, and Bennett's Principles and Practice of Infectious Diseases, Updated Edition. 8th ed. Philadelphia, PA: Elsevier Saunders; 2015:chap 63. Murr AH. Approach to the patient with nose, sinus, and ear disorders. In: Goldman L, Schafer AI, eds. Goldman-Cecil Medicine. 25th ed. Philadelphia, PA: Elsevier Saunders; 2016:chap 426. Pappas DE, Hendley JO. Sinusitis. In: Kliegman RM, Stanton BF, St. Geme JW, Schor NF, eds. Nelson Textbook of Pediatrics. 20th ed. Philadelphia, PA: Elsevier; 2016:chap 380. Rosenfeld RM, Piccirillo JF, Chandrasekhar SS, et al. Clinical practice guideline (update): adult sinusitis. Otolaryngol Head Neck Surg. 2015;152(2 Suppl):S1-S39. PMID: 25832968 www.ncbi.nlm.nih.gov/pubmed/25832968. Josef Shargorodsky, MD, MPH, Johns Hopkins University School of Medicine, Baltimore, MD. Also reviewed by David Zieve, MD, MHA, Medical Director, Brenda Conaway, Editorial Director, and the A.D.A.M. Editorial team. A.D.A.M., Inc. is accredited by URAC, also known as the American Accreditation HealthCare Commission (www.urac.org). URAC's accreditation program is the first of its kind, requiring compliance with 53 standards of quality and accountability, verified by independent audit. A.D.A.M. is among the first to achieve this important distinction for online health information and services. Learn more about A.D.A.M. 's editorial process. A.D.A.M. is also a founding member of Hi-Ethics (www.hiethics.com) and subscribes to the principles of the Health on the Net Foundation (www.hon.ch). The information provided herein should not be used during any medical emergency or for the diagnosis or treatment of any medical condition. A licensed physician should be consulted for diagnosis and treatment of any and all medical conditions. Call 911 for all medical emergencies. Links to other sites are provided for information only -- they do not constitute endorsements of those other sites. Copyright 2002 A.D.A.M., Inc. Any duplication or distribution of the information contained herein is strictly prohibited.